Laurie lives nearby in Alpharetta after relocating from Houston, Texas 1 1/2 years ago. 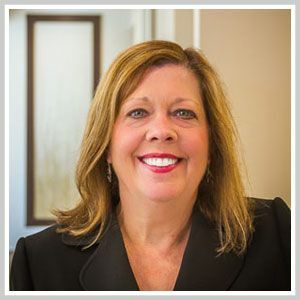 She has over 30 years of dental experience in General and Prosthodontic practice, the last 15 years in dental office management and administration. She enjoys working with patients to explain recommended treatment plans and how we can maximize their dental insurance benefits. She also possesses strong clinical knowledge after working as a dental assistant for 20 years. She enjoys cooking and spending her free time with her wonderful husband, Chet, and their 2 small dogs, Brandy and Ellie. She looks forward to sharing the growth and success of this extraordinary new practice, Muccioli Dental.